The kids and I have only ever seen mainstream American and English children’s programmes. So, when I was sent a link to view the pilot episode of the Nigerian Children’s animated show Bino and Fino I was not sure what to expect. I also didn’t know how Angelo would respond the programme as he still has a short attention span. I need not have been concerned. 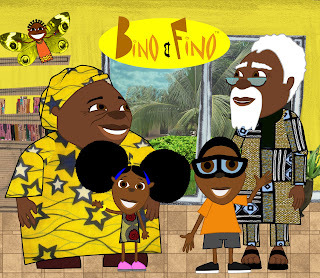 Angelo and I were thoroughly engrossed in the episode of Bino and Fino we saw and he asked for ‘More more’. Bino and Fino was created by Adamu Waziri, a Nigerian animator and produced by his Nigerian based animation company EVCL, Bino and Fino is an African educational cartoon about a brother and sister who live in a modern day city in sub- Saharan Africa. In each episode Bino and Fino, with the help of their friend Zeena the Magic Butterfly and their family, discover and learn things about the world…The series shows aspects of African history, culture and languages to children. The first thing that struck me about Bino and Fino was the use of colour, patterns and textures. I think children will be attracted by this. I was then impressed but the family relationships and the subtle way respect for the elders was portrayed. I liked the fact the episode we saw focused on healthy eating. The animation is aimed at 3 -6 years old and healthy eating is a vital topic for this age group. Many parents, as well as myself have the challenge of getting fussy children to eat. While the episode was not about fussy eating, it did stress eating fruits to be healthy With the help of Zeena The Magical Butterfly, Fino was able to make a fruit salad for her brother Bino. In this episode, little ones will get an introduction to counting and the names of fruits, even a few ‘exotic’ ones. Angelo isn’t old enough to articulate exactly what he enjoyed most about the programme. However, knowing his character, I feel he responded to seeing children on the screen. He enjoys being in the company of older children. I believe that he liked seeing what the Bino and Fino would get up. He may have found a connection in the fact that there’s one boy and one girl like him and his sister. He’s also at a stage where he identifies himself and his family in characters he sees on the tele. We have never viewed a programme with black only characters, prior to this. Whenever he sees a black woman on the tele he says that’s ‘Mummy!’ If he sees a Chinese looking person on tele he may say ‘Uncle!’ or ‘Daddy!’ depending on what the character is doing. So in that vain, I think its wonderful for him to see character that will remind him of me or someone from my side of his family. Last but not least, Angelo loves fruits! So the food element would not have passed him by. While we’ve only seen one episode of Bino and Fino, there is no reason to doubt that each episode will be just has entertaining. Its refreshing to have a children’s programme that shows wholesome family values. It teaches respect, love, kindness and healthy lifestyle: all values that any parent would want their child to have not matter their racial or cultural background. Bino and Fino is certainly worth seeing. You can purchase the DVD on their website. So, to stay in the loop with what’s happening with Bino and Fino you can follow them on Twitter and Facebook.